Try our lime cheesecake recipes for a tangy, change-of-pace dessert. When you try this recipe, take a minute and let us know how it turned out! 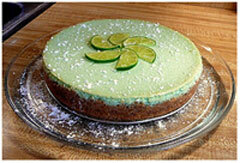 Thanks go out to Crystal for sharing her photo of the Lime Cheesecake she baked a few years back. You can view more of Crystal's photos by clicking here! Combine the graham cracker crumbs and 2 tablespoons of sugar in a bowl. Add the melted butter and blend until the crumbs are wet. Pat this mixture into a lightly greased 10-inch springform pan. Bake the crust in a preheated 375° oven for 8 minutes. Beat the cream cheese and 3/4 cup of sugar until smooth. Add the eggs (one at a time) and mix well. 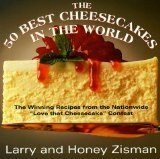 Bake the cheesecake in the preheated oven for 15 minutes, then reduce the temperature to 250° F (120 °C) and bake for 50 to 55 minutes longer, or until the center is barely set. Let the cheesecake cool on a rack, then chill it, covered, overnight. Remove the cheesecake from the pan and transfer it to a cake stand. Garnish with 8 oz. cool whip, grated lime rind and thin slices of lime. 4) running the tip of a sharp knife around the top edge right after baking, plus cooling to room temperature before refrigerating is supposed to keep it from cracking. 5) If you follow these tips I guarantee that they'll work!